I'm so glad and exited about your new web page. The first fish which I order doing very well and is in Fantastic Shape! Actually they adjust for about 2 weeks. I should become agent for your Company - I'm joking, no time Cary I gat work a lot to do. I'm really Proud with your fish and thanks God made people as you ! I wanted to write and tell you what a pleasure and an honor it was to meet you this weekend. Although it was the first time we met in person it seemed like running into an old friend. I really enjoyed your presentation. I found it informative, entertaining and very interesting. Your experience and expertise show in your comfort level when talking about the fish. Your passion for the hobby is so obvious. Thank you so much for giving of your time and sharing with those of us back east! I also want to thank you for the fish. He is absolutely gorgeous. I couldn't really see what he looked like at Al's but when I got him home and introduced him into the tank he was absolutely beautiful... now that he has been there a few days I am really taken with him. Granted I am quite naive and still a newcomer but I personally have never seen a fish that color. His markings are so delicate and subtle. He is a wonderful addition to my collection. I am at a funny stage here... I am actually pretty contented with the fish that I have.... Not to compare with anyone else but even after looking at so many posts and pics when I sit down in my fish room and look at my fish I look with awe and gratitude at these beautiful creatures. If it weren't for you and Al, I would not be at this point. In fact I doubt that I would be in any phase of the hobby at all. You guys helped me through that learning curve to this point of being able to raise healthy, fat and happy discus. I purchased 10 discus (4) Snake Skins, (4) Red Turquoise (2) Striated Pigeon Bloods and 5 Blue Rams from you just before Christmas. Out of the 10 I have managed to keep 9 of them happy. One passed away within a week or so and I thought here I go, but did they prove me wrong. These guys will eat ten times a day if I let them. They get Blood Worms at 8:00 A.M.-Tetra Color Bits (Slow Sinking) at 1:00 P.M. Lights on at 3:00 P.M. Shrimp at 6:00 P.M. and Flakes or Pellets again at 10:00 P.M. Lights Out at 11:00 P.M. They get your Magic Recipe only on the weekends as it tends to foul the water so I watch it carefully. They are in a 100 gallon tank Temp set at 84 deg. Filtering with (2) Aqua Clear 500 & (2) six in Sponge filters. The tank is populated with live plants. Substrate is silica Sand. Change 25% of the water every 10 to 14 days. There is also 3 green Cory Cats. One of the Pigeons Eats very well but does not seem to want to grow he has been stuck at about 2.0" inches for weeks. All the Rams turned out to be Males but they have all grown to about 2.0" to 2.5" long and seem to get along pretty well. One of the Pigeon Bloods is about 4.0" inches long the rest of the Discus are between 3.0" to 3.5" inch's long other then the one. They have thick bodies with nice red coloring in the eyes. Their colors are starting to show up know and they are turning into very beautiful specimens. Just wanted to let you know how your babies are doing. If any of the information I gave you needs to be adjusted please let me know but the Discus seem to be happy at this time. At what age should I watch for them to start choosing mates or setting up territory? "Do you want healthy discus? Do you want nice, round, brilliant discus? Do you want great shipping? 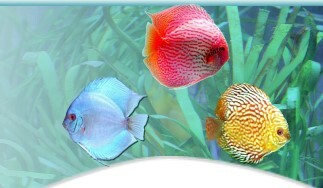 Do you want an honest discus breeder and seller? Do you want expert advice before and after a sale? Do you want the best discus you can buy? Do you want to do it over the internet without worry? You are at the right place. Look no further. All the above and MORE are here!